Now that 2017 is well underway, I wanted to loop back around on my organization situation to review where the cards – or rather notebooks – have fallen. What am I actually carrying around in my bag? Which notebooks do I write in every day? Do I have too many notebooks? Sure, some may say that. But I love them all. 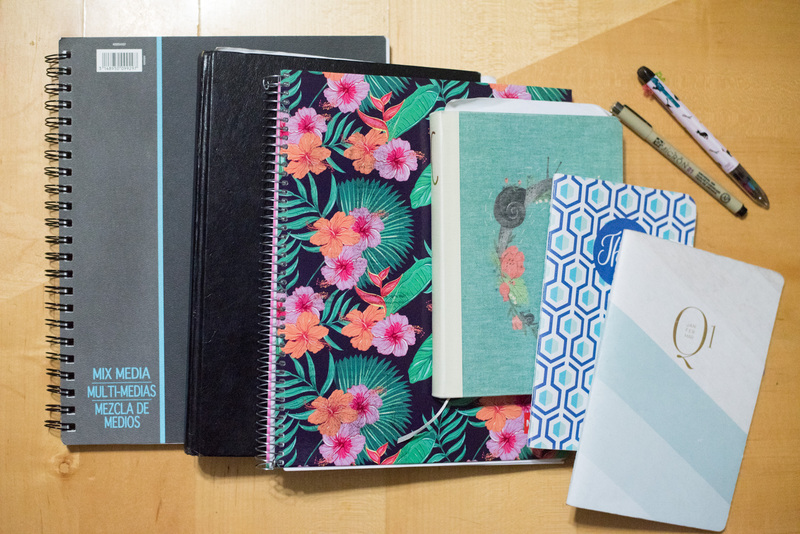 I’m not going to call out the ones that didn’t make it off the shelf, but these are really the best notebooks of 2017. I’m still going strong with the Inkwell Press Quarterly Planners. I used these last year and they were amazing. Why mess with a good thing? This planner is so great for mapping out your goals and making them happen. I love the way the 2017 planner is improved with a thicker cover than last year’s and incorporates some of the elements of bullet journaling into it. Now that I’m nearing the end of the first quarter though, I almost wish I didn’t have to put it away. I’ve taken more of a bullet journal key approach to the daily overview pages, so in addition to my daily schedule it has the spark of many ideas that I haven’t had time to execute on yet. Does anyone else see May Designs everywhere these days? With good reason. These notebooks are awesome. May Designs is a notebook company founded by Mica May, who I recently met at Thrive Conference in the Woodlands. My May notebook has a super thick cover that’s just perfect for tossing in my purse. This journal is rife with whimsical details like pink-lined paper, a striped inside cover, and a hexagon game going strong on the outside design. To my dismay, this notebook is filling up quickly! I guess I’ll have to buy another one. May Designs stands out with super-cute notebook covers fueled by collaborations with artists, and custom notebook covers that you can design yourself. They also carry academic agendas, planners, and health journals. Don’t miss the Emily Ley planner collaboration or the notebook covers by Stephanie Ryan and Samantha Santana. C is for Cynthia, and Likely By C. This as my daily journal for writing in, and the unlined pages mean I don’t have to be confined to just writing. I can draw too 🙂 There are very few notebooks I like to write on with a Micron that aren’t art notebooks. Microns are archival (acid-free) black pens for art drawing. Using them on a regular notebook is absurd and a waste of ink. I prefer black gel pens for writing in regular notebooks and this cool printed Coleto multi-pen for color coding everything. It has cats on it and blossom color tabs. Anyway, the way Microns glide over the paper surface in this notebook is just divine. The journal is cute, fabric-covered, doesn’t show dirt, and – like all Anthropologie things -embellished with the most divine details. An ivy pattern climbs on the sides of the pages, a polka print dots the inside pages, and a snail illustration on the front reminds me to value slowness. Good things come with time. When I slow down enough to process, work, and reflect, my projects develop better. Tired of looking at a legal pad at work? I bought this floral print MiquelRuis notebook to spice up my work notes. I love the way that the paper is lined with a rainbow of pastel colors for 4 subjects, the inside cover is pink, and it’s the perfect size to tuck in 8.5×11 printouts for meetings or stack on my laptop when going to and fro in the office. I’ll be honest: I love this tropical floral print. Did it inspire our upcoming trip to Costa Rica, or did the upcoming trip to Costa Rica inspire me to buy the notebook? Chicken? Egg? It doesn’t matter. I do my best work when I’m inspired and this notebook puts a smile on my face every time I see it. I haven’t been without one of these bad boys since college.This is the workhorse of sketchbooks: unlined, white, acid-free paper for drawing on with pencil or pen. It’s great for brainstorming, working out ideas or collages, and drawing in front of the TV. But I’m a bit of a snob when it comes to paper quality and don’t like using paint on these sketchbooks. It wrinkles the pages. The sturdy cover makes this bad boy great for traveling around with and tossing in whatever bag for the day. Although I use the large bound notebook, it comes in a variety of sizes depending on what suits your needs. My old faithful (not pictured). I write down the sequences to all of the yoga, dance, and aerial classes that I go to in my Black & Red. I keep this notebook in my car door (hence not pictured – it really doesn’t leave the car), so I can write down the sequences and notes as soon as I leave class. This makes for a great reference to look back on what I’ve been working on, build fresh yoga sequences from, or experiment with ways to call out poses. I specifically chose the Black & Red for this because it’s a good quality, classic, bold and professional notebook, which is the way I like to think about my fitness classes. There you have it! Notebooks for every daily occasion. Do I have too many notebooks? Maybe. But they are all awesome. This system works for me. Did I leave any awesome notebooks out? Let me know what your organizational system looks like!